Looking for a unique holiday gift basket, birthday, thank you or corporate food gift? Why not gift them with a Pittman and Davis gourmet fruit basket filled with the juiciest selections of not so forbidden fruit. Your discount will be processed automatically at checkout on the Pittman & Davis website. Gourmet fruit gift basket - Far better than any gourmet produce aisle, choose a gourmet fruit gift basket filled with luscious Ruby Red grapefruit, a basket of juicy sweet navel oranges, baskets of Nova tangelos or featuring other delicious citrus treats. Can't decide? Do a half and half with a basket of citrus sweet grapefruit and oranges. Choose from sturdy willow baskets or quaint half-bushel baskets that are so bountiful and useful, your loved ones will be reminded of your generosity for years to come. Unique holiday gift basket - Give your treasured friends and family members a unique holiday gift basket filled with fruits as festive as Christmas itself. With plenty of Christmas fruit baskets to choose from, you'll want to order them all to put under your tree. Pick up a handsome fruit centerpiece or a fruit cornucopia for your Thanksgiving or Christmas celebrations, or leave Santa a Grand Fruit Basket expertly packed with over fifteen pounds of delicious fruits and confections! Corporate food gift - When shopping for co-workers, clients, bosses or employees, you want a corporate holiday gift that really shows your appreciation. With fresh fruit that's ripe for the picking, you can't go wrong with a fresh fruit basket from Pittman and Davis's juicy collection. With items that are perfect for everyone on your corporate gift list, whatever occasion or season it may be, give your employees a corporate food gift they'll devour like it's their job. Dried fruits, nuts and more - Besides their unique holiday gift baskets of fruit, you'll go nuts over Pittman and Davis' stock of nuts, candies, smoked meats, cheeses and more! If you're a sucker for dried fruit gifts, you'll adore their dried dates or dried apricot selections. Or indulge in gourmet treat heaven with bourbon balls, caramel apples, pecan pralines, pecan pies, fruit cakes, cheese straws, brownies and we're just getting started. Harvest-a-month club - Give them the gift of fruit all year round with Pittman and Davis's Harvest a Month Club! For a unique holiday gift basket that keeps on giving, or to fill your own fruit bowl, enjoy Comice Pears in November, Minneola Honeybells in January, Bing Cherries in June, Mangoes in August, and the freshest of fruit selections every month in between, all fresh and at the peak of their season! 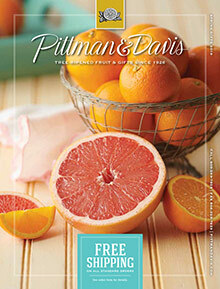 Bringing tree-ripened fruit and gifts to your door since 1926, nobody does fruit better than Pittman and Davis.